In this article, I am going to show you how to search and filter your users by the Gravity Forms that they have completed and how to create a custom user export so you can email only these users. For this tutorial, we are going to use the Gravity Forms module and the custom export feature that are bundled with Users Insights by default. The Gravity Forms module adds a few filters to the Users Insights plugin that allows you to search and filter your users by their Gravity Forms data as well as create your own custom Gravity Forms user reports. If you use the Gravity Forms User Registration add-on, the module will also detect and add all the custom user fields created with the add-on. These custom user fields are also available in the user table, the custom user profiles and the Users Insights filters. The other feature that we are going to use is the custom user export feature. This feature allows you to create your own custom user exports in a CSV format, where you have the option to export only a selected set of users and also choose the fields to be exported. Once you have filtered your user list and found the set of users that you need to email, you can create a custom export of this list. To export the filtered list of users, all you have to do is click on the “export” button from the right menu of the Users Insights page. Before you do the export make sure that you have made all the fields that you want to be exported visible in the users table, especially the user email field. If there are some fields that you don’t want to be exported, you can hide them from the “eye” menu. In this example, we will export only the name and the email of the users, since this is the only information that we need in order to send the emails. After you click on the “export” button the export will start the generation and create a CSV file download on your computer. Now that you have a list of all the users that have not completed the specific Gravity Forms form, you can easily import it into your favourite email campaign tool and send an email. For example, if you are using MailChimp or Campaign Monitor, you can also check our How to import WordPress users into MailChimp and How to import WordPress users to Campaign Monitor articles for all the details. That’s it! 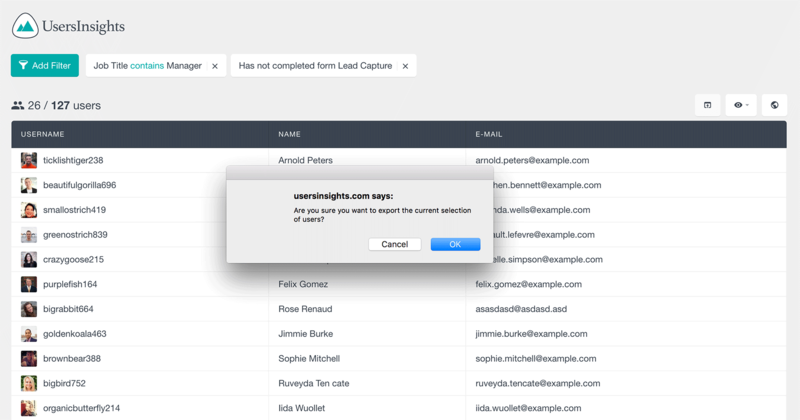 Now you know how to use the Users Insights filters to find and email all the users who have not completed a Gravity form. We hope that you will find this article useful and that it is going to help you increase the form submission activity on your site.